Rubber Room Ramblings: GREENHOUSE GARDEN! I debated over purchasing this stamp set for a long time. I mean, really, do I need one more flower? Flowers to me are like butterflies and black shoes... there is no such thing as "too many". So, as you can see, I purchased it. AND, nope, I am not sorry I did!! This is the first card we'll be making when "The Wright Club" meets this coming Friday. 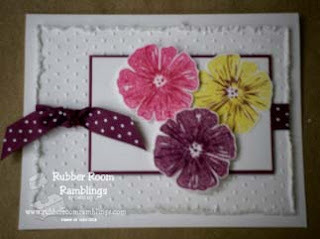 It is made with flowers from the current In Color group: Melon Mambo, Rich Razzleberry and Crushed Curry. I think that combination is so bright and with all the white, it looks very clean and neat. I also added a little extra texture by putting a layer of my Whisper White Cardstock through my Cuttlebug with the Dotted Embossing Folder. The Rich Razzleberry Dotted Grossgrain Ribbon adds a whimsical touch.